The map below shows the six Zones. Chapter 5 of the 2017 Report describes each of the Transmission Planning Zones in the state. The zones have not changed over the years so the description below for each zone is essentially identical to what was provided in past reports, although any changes in the transmission system in a particular zone that occurred over the past two years are described in each section. The discussion for each zone contains a list of the counties in the zone and the major population centers. The utilities that own high voltage transmission lines in the zone are also identified. A description of the major transmission lines in the zone is provided. Transmission systems in one zone are highly interconnected with those in other zones and with regional transmission systems. A particular utility may own transmission facilities in a zone that is outside its exclusive service area, or where it has few or no retail customers. Different segments of the same transmission line may be owned and/or operated by different utilities. A transmission line may span more than one zone, and transmission projects may involve more than one zone. Chapter 6 describes the needs for additional transmission facilities that have been identified for each zone. Chapter 7 contains additional information about each of the utilities filing this report, including their existing transmission lines. The Northwest Planning Zone is located in northwestern Minnesota and is bounded by the North Dakota border to the west and the Canadian border to the north. The Northwest Planning Zone includes the counties of Becker, Beltrami, Clay, Clearwater, Kittson, Lake of the Woods, Mahnomen, Marshall, Norman, Otter Tail, Pennington, Polk, Red Lake, Roseau, and Wilkin. Primary population centers within the Northwest Planning Zone (population greater than 10,000) include the cities of Bemidji, Fergus Falls, and Moorhead. A major portion of the transmission system that serves the Northwest Planning Zone is located in eastern North Dakota. Four 230 kV lines and one 345 kV line reach from western North Dakota to substations in Drayton, Grand Forks, Fargo, and Wahpeton, North Dakota, along with a 230 kV line from Manitoba and a 230 kV line from South Dakota. Five 230 kV lines run from eastern North Dakota into Audubon, Moorhead, Fergus Falls, and Winger, Minnesota. These five lines then proceed through northwestern Minnesota and continue on to substations in west-central and northeastern Minnesota. Additionally, a 230 kV line from Manitoba to the Northeast Zone crosses the northeastern corner of this zone and provides power to local loads. The 230 kV system supports an extensive 115 kV, 69 kV, and 41.6 kV transmission system which delivers power to local loads. The major change in the transmission system in the Northwest Zone since 2011 is the addition of a 230 kV line between Grand Rapids in the Northeast Zone and Bemidji in the Northwest Zone (a CapX2020 project). This line was energized in November 2012. This project has been referenced under Tracking Number 2005-NW-N2 and MPUC Docket No. E015,ET6,E017/TL-07-1327. The MPC Center-Grand Forks 345 kV project was completed in early 2014 and will bring power from Center, North Dakota to Grand Forks, North Dakota. Also, the CapX Fargo-St. Cloud 345 kV project was completed in 2015 and will transfer power between Fargo, North Dakota and the St. Cloud area. Continued load growth in the northern part of this zone has led to the development of plans for a new 230 kV line from Winger to Thief River Falls. This line is reported under Tracking Number 2007-NW-N3. The Northeast Planning Zone covers the area north of the Twin Cities suburban area to the Canadian border and from Lake Superior west to the Walker and Verndale areas. 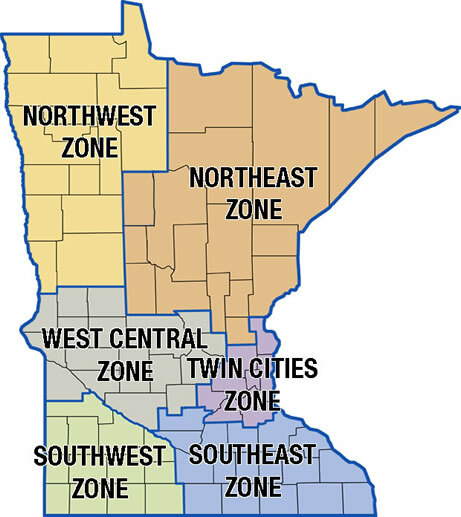 The zone includes the counties of Aitkin, Carlton, Cass, Cook, Crow Wing, Hubbard, Isanti, Itasca, Kanabec, Koochiching, Lake, Mille Lacs, Morrison, Pine, St. Louis, Todd, and Wadena counties. The primary population centers in the Northeast Planning Zone include the cities of Brainerd, Cambridge, Cloquet, Duluth, Ely, Grand Rapids, Hermantown, Hibbing, International Falls, Little Falls, Long Prairie, Milaca, Park Rapids, Pine City, Princeton, Verndale, Virginia, and Walker. The transmission system in the Northeast Planning Zone consists mainly of 230 kV, 138 kV and 115 kV lines that serve lower voltage systems comprised of 69 kV, 46 kV, 34.5 kV, 23 kV and 14 kV. Xcel Energy, Great River Energy, and Minnesota Power own a 500 kV interconnection coming from Manitoba Hydro with interconnections in Minnesota at Forbes and Chisago County. American Transmission Company's 345 kV line runs between Duluth, Minnesota, and Wausau, Wisconsin. Minnesota Power's +/- 250 kV DC line runs from Center, North Dakota to Duluth, Minnesota. The CapX2020 230 kV line between the Bemidji area in the Northwest Zone and the Grand Rapids area in the Northeast Zone (the CapX2020 Bemidji-Grand Rapids project) has been completed. The 345 kV and 230 kV system is used as an outlet for generation and to deliver power to the major load centers within the zone. From the regional load centers, 115 kV lines carry power to lower voltage substations where it is distributed to outlying areas. In a few instances, 230 kV lines serve this purpose. The new Great Northern Transmission Line Project will build approximately 220 miles of new 500 kV coming from Manitoba Hydro to the Grand Rapids, Minnesota area. This project will increase the amount of hydro renewables that can be imported to the state of Minnesota. This line is reported under Tracking Number 2013-NE-N13. A number of projects in the Northeast Zone are part of what is called the North Shore Loop. The North Shore Loop refers to an approximately 140-mile portion of 115 kV and 138 kV transmission lines in the northeastern Minnesota transmission system that is used by Minnesota Power and Great River Energy to serve customers along the North Shore of Lake Superior and in the Hoyt Lakes area. The following discussion about the North Shore Loop and the changes in generation that are taking place in the area is helpful in understanding the need for a number of projects in the Northeast Zone. The North Shore Loop extends approximately 70 miles along the North Shore of Lake Superior from east Duluth to the Taconite Harbor Energy Center near Schroeder, then turns west and extends approximately another 70 miles to the Laskin Energy Center near Hoyt Lakes. Historically, the North Shore Loop was characterized by an abundance of coal-fired baseload generation, including Minnesota Power's Laskin and Taconite Harbor Energy Centers and a large industrial cogeneration facility located in Silver Bay. A geographical representation of the North Shore Loop transmission system is shown in Figure 1 below. Over a span of approximately five years beginning in 2015, all seven of the coal-fired generating units located at these three sites are being idled, retired, or converted to peaking operation. In 2015, the two units at the Laskin Energy Center were converted from coal-fired baseload units to natural gas peaking units. Also in 2015, Minnesota Power retired one of the units at Taconite Harbor. With Commission approval in the 2015 Integrated Resource Plan, Minnesota Power idled the other two Taconite Harbor units in the fall of 2016 with all coal-fired operations to cease at the facility by 2020. In June 2016, Silver Bay Power Company began operating with one of the two Silver Bay units normally idled. By the end of 2019 both Silver Bay units will be idled, leaving no baseload generators normally online in the North Shore Loop. This transition away from local coal-fired baseload generation in the North Shore Loop has necessitated an evaluation of the transmission system in the area to ensure that it may operate reliably and with sufficient load-serving capacity without the power and voltage support previously provided by the generators. While evaluation of the long-term impacts of these changes is ongoing, several necessary transmission improvements have already been identified and are in various stages of project development and execution. Projects located in the North Shore Loop or related to the transitional changes in the North Shore Loop include: Minntac 230 kV Bus Reconfiguration (Tracking Number 2015-NE-N10), Forbes 230/115 kV Transformer Addition (Tracking Number 2015-NE-N11), Laskin-Taconite Harbor Voltage Conversion (Tracking Number 2017-NE-N2), North Shore Switching Station & Cap Banks (Tracking Number 2017-NE-N7), Babbitt Capacitor Bank (Tracking Number 2017-NE-N8), ETCO Capacitor Bank (Tracking Number 2017-NE-N9), Forbes 3T Breaker Replacement (Tracking Number 2017-NE-N10), North Shore Dynamic Reactive Device (Tracking Number 2017-NE-N15), 18 Line Upgrade (Tracking Number 2017-NE-N17), North Shore Transmission Line Upgrades (Tracking Number 2017-NE-N19), Two Harbors 115 kV Project (Tracking Number 2017-NE-N20), Laskin-Tac Harbor Transmission Line Upgrades (Tracking Number 2017-NE-N21), and Hoyt Lakes 115 kV Project (Tracking Number 2017-NE-N23). The West Central Transmission Planning Zone extends from Sherburne and Wright counties on the east, to Traverse and Big Stone counties on the west, bordered by Grant and Douglas counties on the north and Renville County to the south. The West Central Planning Zone includes the counties of Traverse, Big Stone, Lac qui Parle, Swift, Stevens, Grant, Douglas, Pope, Chippewa, Renville, Kandiyohi, Stearns, Meeker, McLeod, Wright, Sherburne, and Benton. The primary population centers in the zone include the cities of Alexandria, Buffalo, Elk River, Glencoe, Hutchinson, Litchfield, Sartell, Sauk Rapids, St. Cloud, St. Michael, and Willmar. This transmission system in the West Central Planning Zone is characterized by a 115 kV loop connecting Grant County-Alexandria-West St. Cloud-Paynesville-Willmar-Morris and back to Grant County. These 115 kV transmission lines provide a hub from which 69 kV transmission lines provide service to loads in the zone. 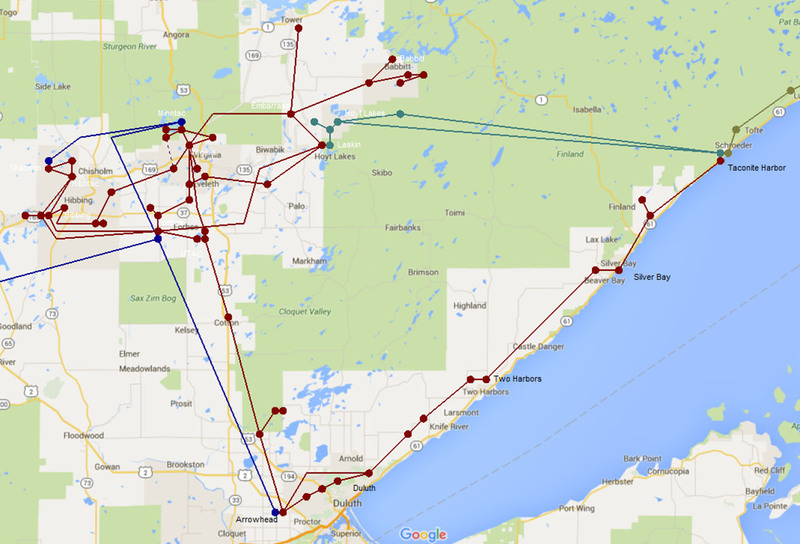 A 345 kV line from Sherburne County to St. Cloud and 115 kV and 230 kV lines from Monticello to St. Cloud provide the primary transmission supply to St. Cloud and much of the eastern half of this zone. Two 230 kV lines from Granite Falls – one to the Black Dog generating plant in the Twin Cities and one to Willmar – provide the main source in the southern part of the zone. Demand in the St. Cloud area continues to grow and several individual projects are being considered to address the need for more power into this area. The new CapX Quarry substation will provide significant relief to the St. Cloud area system deficiencies. The CapX Fargo-St. Cloud 345 kV project was completed in 2015 and will transfer power between Fargo, North Dakota and the St. Cloud area. The CapX Brookings, South Dakota-Twin Cities 345 kV project was also completed in 2015. Some of the 69 kV network is becoming inadequate for supporting the growing load in the area. Solutions to the 69 kV transmission inadequacies may involve construction of new 115 kV transmission lines. Therefore, any discussion about the inadequacy of the existing system must include an analysis of parts of the existing 69 kV transmission system. The Twin Cities Planning Zone comprises the Twin Cities metropolitan area. It includes the counties of Anoka, Carver, Chisago, Dakota, Hennepin, Ramsey, Scott and Washington. There are no major changes in the transmission facilities located in the Twin Cities Zone since 2013, although several projects are under review by the Minnesota Public Utilities Commission. The transmission system in the Twin Cities Planning Zone is characterized by a 345 kV double circuit loop around the core Twin Cities and first tier suburbs. Inside the 345 kV loop, a network of high capacity 115 kV lines serves the distribution substations. Outside the loop, a number of 115 kV lines extend outward from the Twin Cities with much of the local load serving accomplished via lower capacity, 69 kV transmission lines. The GRE DC line and 345 kV circuits tie into the northwest side of the 345 kV loop and are dedicated to bringing generation to Twin Cities and Minnesota loads. Tie lines extend from the 345 kV loop to three 345 kV lines: one to eastern Wisconsin, one to southeast Iowa and one to southwest Iowa. The other tie is the Xcel Energy 500 kV line from Canada that is tied into the northeast side of the 345 kV loop. Major generating plants are interconnected to the 345 kV transmission loop at the Sherburne County generating plant and the Monticello generating plant in the northwest, the Allen S. King plant in the northeast, and Prairie Island in the southeast. On the 115 kV transmission system in the Twin Cities Planning Zone there are three intermediate generating plants: Riverside (located in northeast Minneapolis), High Bridge (located in St. Paul), and Black Dog (located in north Burnsville). There are also two peaking generating plants – Blue Lake and Inver Hills – interconnected on the southeast and the southwest, respectively. The CapX Brookings-Twin Cities 345 kV project was completed in 2015 and will transfer power between the southwest corner of the Twin Cities and Brookings, South Dakota. The CapX 345 kV project between the southeast corner of the Twin Cities area, Rochester, and LaCrosse, Wisconsin, was also completed in 2015. The Southwest Transmission Planning Zone is located in southwestern Minnesota and is generally bounded by the Iowa border on the south, Mankato on the east, Granite Falls on the north and the South Dakota border on the west. It includes the counties of Brown, Cottonwood, Jackson, Lincoln, Lyon, Martin, Murray, Pipestone, Redwood, Rock, Watonwan, and Yellow Medicine. The primary population centers in the Southwest Zone include the cities of Fairmont, Granite Falls, Jackson, Marshall, New Ulm, Pipestone, St. James, and Worthington. The transmission system in the Southwest Zone consists mainly of two 345 kV transmission lines, one beginning at Split Rock Substation near Sioux Falls and traveling to Lakefield Junction and the second traveling from Mankato, through Lakefield Junction and south into Iowa. Lakefield Junction serves as a major hub for several 161 kV lines throughout the zone. A number of 115 kV lines also provide transmission service to loads in the area, particularly the large municipal load at Marshall. Much of the load in the southwestern zone is served by 69 kV transmission lines which have sources from 115/69 kV or 161/69 kV substations. The 115 kV lines also provide transmission service for the wind generation that is occurring along Buffalo Ridge. The transmission system in this zone has changed significantly in recent years with new transmission additions to enable additional generation delivery. Continuing these changes, the system will soon be enhanced by the addition of the Twin Cities-Brookings 345 kV transmission line to provide additional outlet for the wind generation in the Southwest Zone which is scheduled to be completed by the end of 2015. In addition to enabling additional delivery of wind generation, these lines will provide opportunities for new transmission substations to improve the load serving capability of the underlying transmission system. The CapX Brookings, South Dakota-Twin Cities 345 kV project was completed in 2015. The Southeast Planning Zone includes Blue Earth, Dodge, Faribault, Fillmore, Freeborn, Goodhue, Houston, Le Sueur, Mower, Nicollet, Olmsted, Rice, Sibley, Steele, Wabasha, Waseca, and Winona Counties. The zone is bordered by the State of Iowa to the south, the Mississippi River to the east, the Twin Cities Planning Zone and West Central Planning Zone to the north, and the Southwest Planning Zone to the west. The primary population centers in the zone include the cities of Albert Lea, Austin, Faribault, Mankato, North Mankato, Northfield, Owatonna, Red Wing, Rochester, and Winona. The major change in the Southeast Planning Zone is the completion of the CapX 345 kV line from the Hampton Substation to LaCrosse, Wisconsin. This line will help increase local reliability along with helping increase renewable generation transfer to the east. The transmission system in the Southeast Planning Zone consists of 345 kV, 161 kV, 115 kV and 69 kV lines that serve lower voltage distribution systems. The 345 kV system is used to import power to the Southeast Planning Zone for lower voltage load service from generation stations outside of the area. The 345 kV system also allows the seasonal and economic exchange of power from Minnesota to the east and south from large generation stations that are located within and outside of the zone. The 161 kV and 115 kV systems are used to carry power from the 345 kV system and from local generation sites to the major load centers within the zone. From the regional load centers and smaller local generation sites, 69 kV lines are used for load service to the outlying areas of the Southeast Planning Zone.